As any parent knows, babies are delicate beings and bath time was always a stressful time in the newborn stage. It’s hard enough when a baby can’t sit up on their own and when soap is added into the mix – it is a slippery mess. I opted on having my husband bathe her many times for fear she’d slip through my small, delicate hands. With LatherMitts, You’ll Never Use A Wash Cloth On Your Little One Again! Safety: The gentle neoprene grip that lines LatherMitts’ thumb and forefinger ensures that squirmy, slippery kids are secure and safe in your hands. Neoprene, commonly used in wetsuits, is hypoallergenic, non-slip and is naturally resistant to oil, mildew and mold. 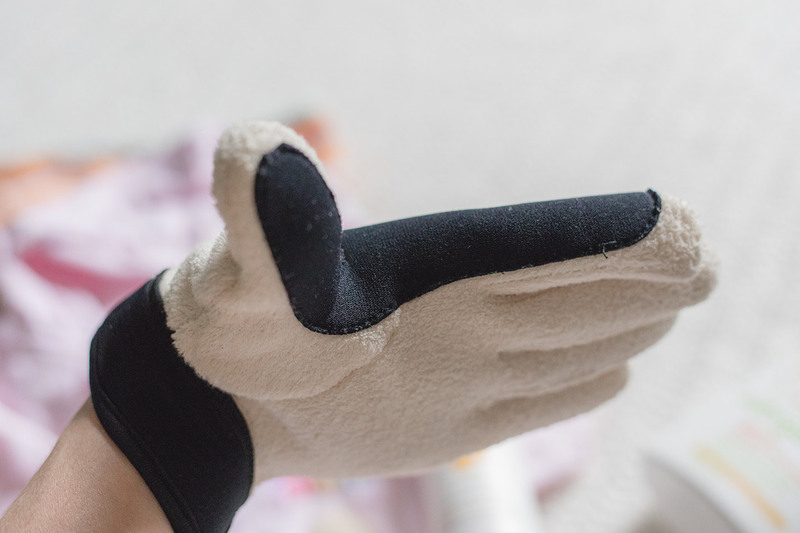 Quality: The rest of the glove is made of white organic cotton, perfect for a baby’s sensitive skin. 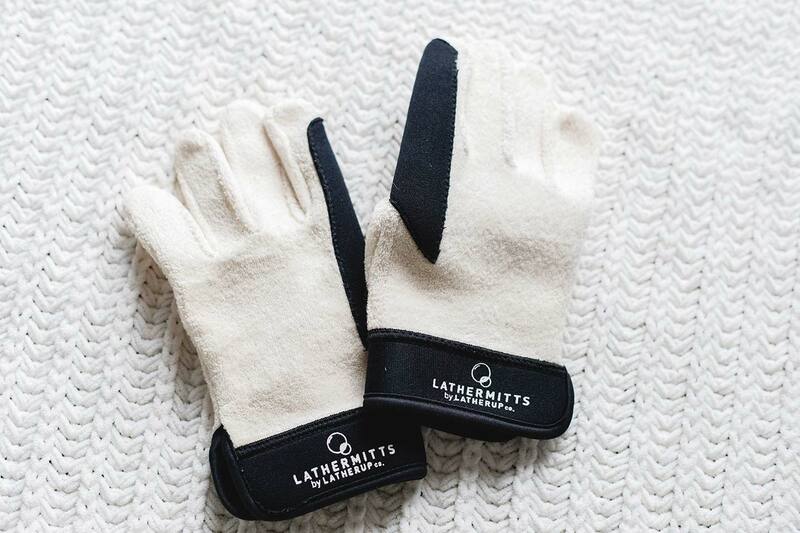 Dexterity: The glove design of LatherMitts allows you full use of both hands and all ten fingers, making it easy to get into hard-to-reach places like behind ears and under chins. LatherMitts are made of a soft, cotton terrycloth, similar to washcloths you would purchase for your baby. Currently, they are available in cream and black. The neoprene grips (on the forefinger & thumb) are black to stand out from the rest of the glove. I love that it provides that extra comfort in keeping a grip on your sudsy sweetie. I would love to see other options in the future, perhaps a print or a variety of colors to choose from. LatherMitts can be rewashed and reused again and again the same way you would use a washcloth. We’re currently on an every other night bath schedule, so it’s perfect, we wash them weekly. LatherMitts come in sizes small to extra large, so mom, dad or any caregiver can cover bath time duties. I was given the small to try and it fit me perfectly. I was happy with the snug fit, it helped ensure a good grip when picking up my baby without the fear of the gloves slipping. The gloves easy slip onto both of your hands! One hand to hold your baby and the other to soap and lather. 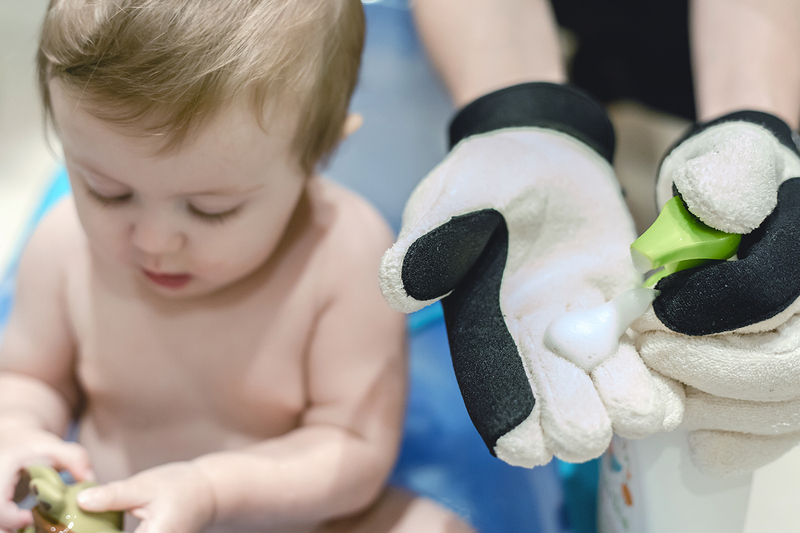 My daughter is 9 months old and loves bath time, she giggles when I use the gloves when I wash under her arms and behind her ears (she is super ticklish). After trying the LatherMitts I can say with confidence this product is a must-have item for moms, dads & caregivers. Giving peace of mind during bath time the LatherMitts allows you to lift your baby with ease in and out of the tub. The organic cotton is soft and since the mitts covers the fingers allow you to get in the hard to reach places, like behind the ears and under the chin. I will be sure to recommend these to my family & friends! Anyone who has given a baby a bath is familiar with how stressful and challenging it can be. They are squirmy and slippery, and the tiny washcloths you see in stores just don't get the job done. 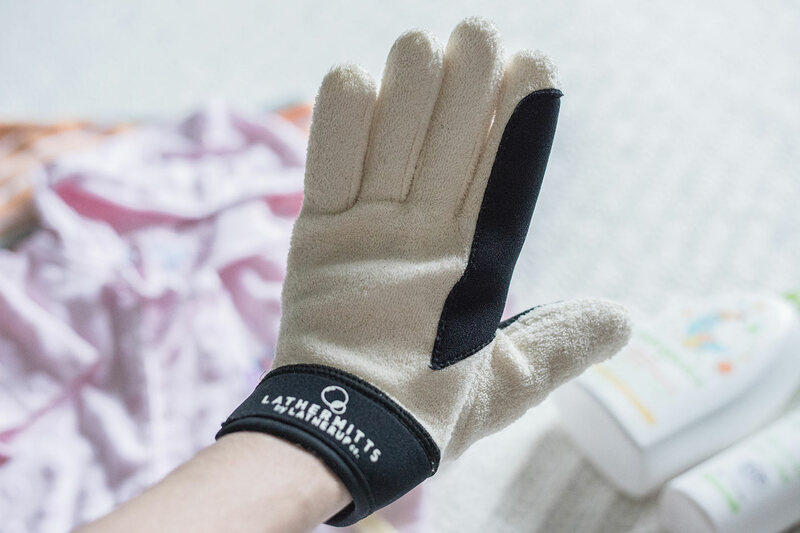 LatherUp aims to fix that with LatherMitts, bath gloves with revolutionary design elements to allow parents to keep a good grip on baby and get them clean, head to toe. Amazon or their website LatherMitts – LatherUp Co.
Disclaimer: I was provided with a free pair of LatherMitts in exchange for an honest review on my blog. All photos are copyright to MommaReview.com. All views in this review are 100% my own. This page contains affiliate links.